Appel (right) with likely No. 1 overall NFL draft pick Andrew Luck (photo courtesy Stanford Athletics). 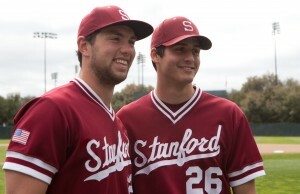 Heading into this weekend’s Pac-12 series opener against USC, Stanford remains one of the hottest teams in the nation, and Cardinal pitcher Mark Appel has been a big part of it. Stanford is 13-2, with series sweeps against 2011 College World Series teams Vanderbilt and Texas and a 2-1 series win over Rice. Appel was just 6-7 last year, but he sports a 2-1 record with a 3.19 ERA, a .157 opponent batting average and 40 strikeouts in 31.0 IP this season. The junior’s 2011 record is deceiving, because he matched-up on Fridays against the likes of 2011 first round MLB picks Sonny Gray, Taylor Jungmann and Gerrit Cole. In this exclusive interview with College Baseball 360 editor Sean Stires, Appel discusses what he learned from those matchups, his head coach Mark Marquess, his thoughts on the Cardinal offense that’s hitting .312 and averaging 8.4 runs a game, Stanford quarterback Andrew Luck, and much more! Press the “Play” button below to listen to the interview.